Buy car batteries in Round Rock at a Firestone Complete Auto Care near you. Make an appointment online to have your current car battery tested or get a new Interstate battery installed today! All too often we wait until our car or truck battery is completely drained before getting a new one. Your vehicle needs a strong battery to deliver the power your engine needs to get up and go. In Round Rock, Firestone Complete Auto Care is the right auto care center for battery replacement, service, and testing. If you notice a slow engine crank or your check engine light is on, it may be time for a new battery. Low battery fluid and corrosion around the terminals are also indicators of a battery that may soon fail you. With the help of our technicians, you can drive off with the right battery at the right price—before you're stuck with a car that won't start. 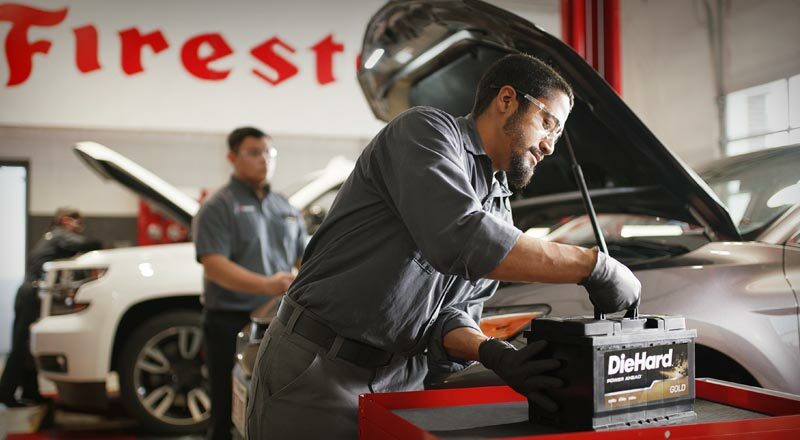 Visit your local Firestone Complete Auto Care for a complimentary battery test in Round Rock. We can give you an idea of the life that's left in your battery, along with the temperature it may die. And when the time comes around, our technicians can work with you to pick the best car battery for your price range and climate. We install over 800,000 batteries each year using America's #1 replacement battery, Interstate Batteries. They've been the industry leader in reliability and performance since 1965, and that's time tested technology and experience we trust. From testing to replacement to recycling, we'll help get your car or truck running strong, from January through December. A reliable car needs reliable parts. While the automotive battery gets your drive started, other parts need just as much attention. There's your engine, tires, brakes, steering and suspension, alignment, oil, filters, and more! At Firestone Complete Auto Care in Round Rock, we take care of it all. We believe in total car care, from your headlights to your taillights! So whether it's time to wave your old battery goodbye, you're in the market for Firestone tires, or you need an oil change in a jiffy, make an appointment online and head to the nearest Firestone Complete Auto Care. Highly skilled technicians are prepared to care for your vehicle the right way. From transmission work to alignments to engine repair, head to a Firestone Complete Auto Care near you for your car or truck maintenance and repairs. We're your go-to tire store, service center, and repair shop. Our automotive technicians work hard to help ensure that your vehicle runs the way it should. Regardless of the maintenance your car or truck needs, we’ll strive to offer unparalleled auto services. Ready to experience the difference? Book your Round Rock, Texas auto repair or service today.